It's taken me quite a long time to jot down my thoughts on the Ivy, mainly because even up until now, I don't have much of an opinion. For many years, I had wondered what lay behind those stained glass windows, of what had attracted all those "celebrities" in the past, of what gave it that mystique. It's veil of secrecy definitely piqued my interest and when the suggestion to visit for a "work team lunch" was mooted, I nodded in agreement. I was kind of excited. After all these years, I finally got to see what lay behind those multi-coloured windows. 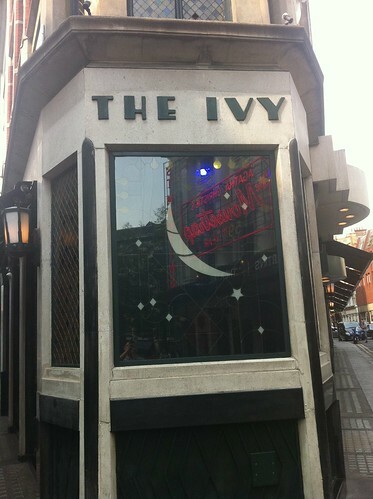 Once inside, I found a room buzzing with atmosphere, filled with those who had clearly frequented the Ivy for many years alogside those who clearly hadn't. The stained glass adds much colour to a classic look, I was genuinely beginning to be swept up in it all. The menu reads like that off a gastropub. Simple hearty dishes with a few cheery additions, but unfortunately the actual delivery was slightly lacklustre and smacked of "make do". My starter of mozzarella was pleasant enough, with an avocado pesto adding a nice and interesting dimension, but ultimately all tasting a bit ordinary. 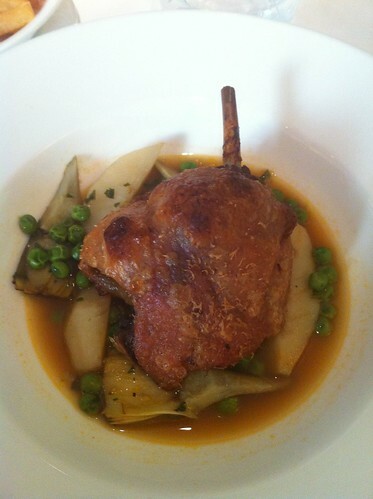 Duck was also ok. A simple confit with some well cooked new potatoes on the side. Filling and a decent enough lunch, but the whole experience left me feeling somewhat underwhelmed. It's clear that people are here for the atmosphere, intrigue and maybe even the chance to spot a "celebrity". I would be quite surprised if it were just for the food. I'm glad I went, but I doubt I will be seen there again, even if I ever reach that "celebrity" status. I was reading Anthony Bourdain's Medium Raw book the other day and he is firmly of the opinion that rich people do not want to eat good food they just want to eat where other rich and famous people eat! Love the review I have been in the Ivy last year for first time with my partner, he know every one inside the restaurant and he always said about the fantastic resturant the Ivy is. 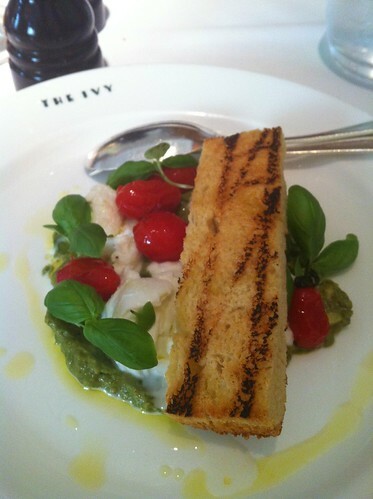 BUt like you said the Ivy is just Atmosphere and good traditional good service, but for me the food is high standard but just average, took me very long to pick a dish, everything look so boring in the menu, no wonder you finish looking for celebreties! I once took a party of eight for a pre-theatre dinner. After the starters and while waiting for the mains, I noticed that time was ticking away and that a nearby table, seated at the same time, had almost finished. I told the waiter that I was worried we wouldn't make it for curtain up. Somehow, the booking hadn't registered as pre-theatre. Unperturbed, the waiter asked which theatre it was and what time it started. We then received their FULL attention, but without any hassle or sense of being rushed. We were able to have deserts and coffee. As I paid the bill (but not before, which is really classy) they informed us that there were two taxis waiting outside, paid for by them. Now, that's smooth as. And the food was good - simple classics done superbly, without the stuffiness of the then prevalent haute cuisine behemoths. Maybe, in today's varied and vibrant restaurant scene, the old lady has become rather tired and shabby . I don't know. I just wanted to explain why it got the reputation it did. @ Rumblyintumbly - I am just making my way through Bourdains books now. Really entertaining reading! @ German - I like a lot about it, but something just didn't click for me either. I think you nailed it, the food just seemed a bit boring. @ theskintfoodie - Thanks for such a lovely and informative comment. If I ever went somewhere where the service had been so on point, I would also have been instantly enamoured with the place! It is definitely looking tired, and the service was not so great when I visited. I guess we are all quite lucky with how vibrant and varied the London restaurant scene has become, where serving simple classics just isn't enough for most of us any more.